Kevin is a returning boarder, and it just so happened that he spent his first birthday at Swine And Dandy! So, like any good host, we celebrated with arts and crafts. 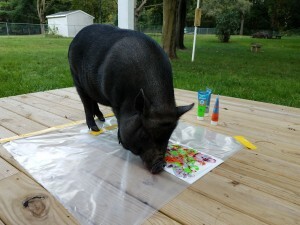 Kevin was a good sport and created a great painting for his Pig Parents to hang up in their home. Kevin also had a great time playing in the leaves and chasing us us around. It was a great introduction to fall!